Turning to the competition for the World Championship of Drivers, British driver Peter Collins was one point ahead of Juan Manuel Fangio, a teammate in Scuderia Ferrari, and four points ahead of Jean Behr-a, a rival pilot from Maserati. All three were hopefuls for the title. Stirling Moss, another title contender, was so behind that his only chance consisted in a disastrous collective failure of the three forerunners. As far as the race was concerned, the two Italian teams Ferrari and Maserati were the pacesetters and most promising winners. Apart from Fangio and Collins, Ferrari had Eugenio Castellotti, Luigi Musso, and Alfredo de Portago at its call. 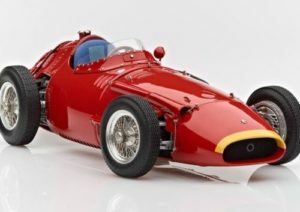 Maserati was most likely to count on Stirling Moss or Jean Behra for a win. But there were also Cesare Perdisa and Paco Godia whom Maserati could use in time of need. As for the French racing team Gordini, it would take the race with two cars only. 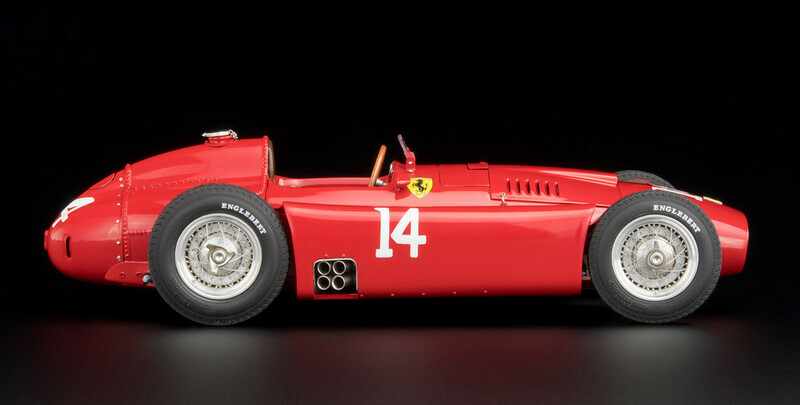 The same was true of the team of Scuderia Centro Sud, which had a Maserati 250F, a Ferrari 500, and nothing else. Of course, one should also take into consideration the contest that might be put up by six private drivers. Ascari’s fatal accident in the wake of the 1955 Monaco GP and the persisting financial difficulties proved to be the last straw for Scuderia Lancia. 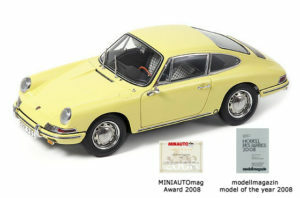 It handed over the D50 fleet, the inventory of parts, blueprints, and documents to Ferrari. Ferrari engineers immediately began to modify the Lancia vehicles. 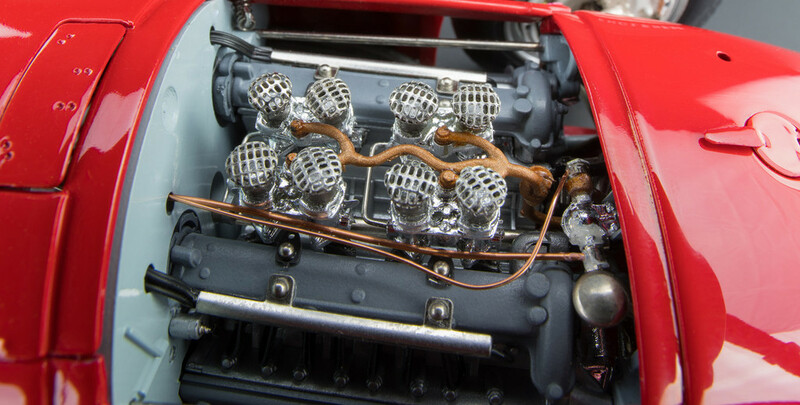 What Ferrari did to the Lancia D50 was not without ground-breaking innovations. 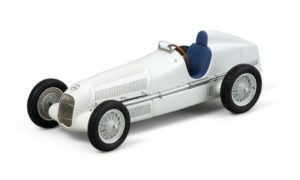 It started a period seemingly dominated by the new Lancia-Ferrari D50 (later “Ferrari D50“ only). The 1956 Grand Prix of Germany stood witness to the ascendance of the Lancia-Ferrari D50 as a new rising star. 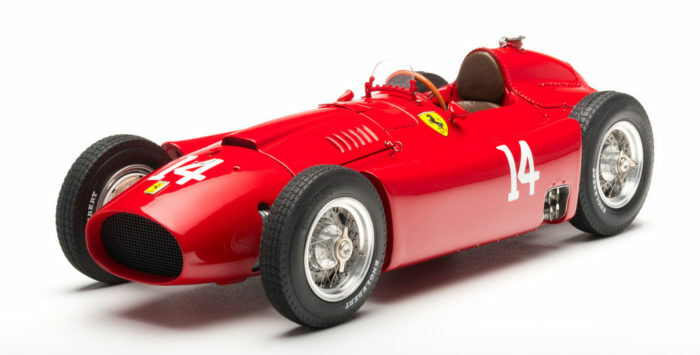 Ferrari’s star driver Juan Manuel Fangio arrived in a D50 fitted with a long nose. Interestingly, Peter Collins also chose to use a longnose D50 for this race. The long nose gave the cars a more sleek appearance, except that Fangio’s car had the tip of its nose painted with a blue/yellow stripe. In contrast, the stripe on the nose tip of Collins‘ car was green. Fangio to pole position. Castellotti took the third starting place after Collins. Behind Castellotti was Stir-ling Moss. The 22-lap race on the Nurburgring lasted 501.82 km in total. It began well for Ferrari. Even before the first corner, Collins managed to take the lead. However, Fangio overtook him in the first lap and never gave up his lead until the end of the race. During the race, Fangio and Collins repeatedly broke the 17-year-old track record, and a new record time was eventually set at 9: 41.6 min by Fangio. Unfortunately, Collins crashed during the race and had to call it quits. In the end, only seven drivers crossed the finish line. Fangio won with a clear lead of 45 seconds over Stirling Moss, who finished a few seconds ahead of Maserati driver Behra for a second place. The big winner of the race was certainly Juan Manuel Fangio, who claimed pole position, victory and the fastest lap time. In the driver’s contest, J.M. Fangio again took the lead and went with an advantage of eight points in the season finale at the still outstanding GP Italy in Monza.